Families from two Evansville schools met with state education representatives Thursday to discuss how they plan to move forward after half a decade of failing accountability scores. 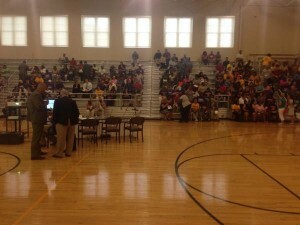 Community members pack the gym at Lincoln School for a public meeting about the school's failing accountability scores. Superintendent Glenda Ritz and members of the Department of Education and State Board of Education staff, including SBOE Executive Director Robert Guffin, heard public comment at both Lincoln Elementary and McGary Middle School, to solicit input on how to better serve students. Assign special management teams to operate all or part of the schools. Implement recommendations from the IDOE for improving the schools. Implement other options for improvement expressed at the hearing. Revise the schools’ plans in the areas of procedures and operations, professional development or intervention for teachers and administration. 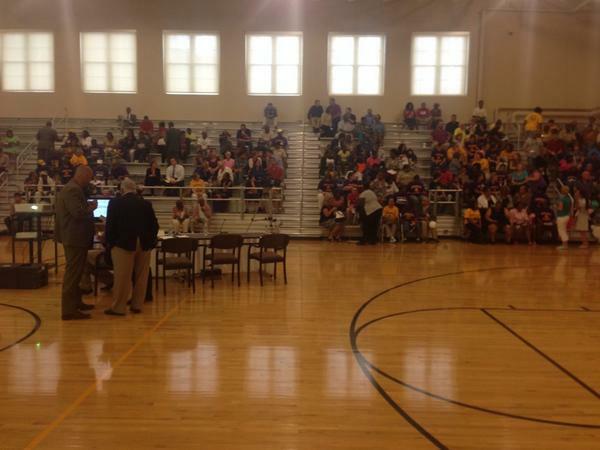 School officials have discussed options for months now. They launched their own improvement effort after the 2012-13 school year, involving a new district turnaround office and a contract with Boston-based school turnaround group, Mass Insight. Rumsey said she struggled in school, but Lincoln and the staff there helped her find ground in her work, and figure out how she wanted to do with her life. Similar problems plague a handful of other schools in the Evansville district. They’ve had some of Indiana’s worst passing rates on the ISTEP+ exams, as well as poor marks for student growth and college and career readiness. Those accountability grades are crucial. They help determine school funding, teacher pay and possible state takeover of low performing schools. Schools in their sixth year of “Academic Watch” can face state takeover. State officials also have the option to hire an outside company of their choice to offer turnaround assistance. The State Board of Education makes the final call on school improvement methods. Suggestions gathered for the Evansville schools will be presented to the board at its next meeting. StateImpact Indiana is a collaboration of WFIU and Indiana Public Broadcasting stations to explain the effects of state education policy on people's lives.